GE Silicone II* Concrete & Masonry 100% Silicone THREE-HOUR RAIN-READY - Caulk has to have enough time to build adhesion to the surface and cure or dry adequately so it won't wash away when exposed to water. That means if rain is in the forecast, homeowners and pros typically will have to delay or cancel a project when using most caulks. If not, the rain might wash the caulk away and the job will have to be redone. Silicone caulk, such as GE Silicone II* Concrete & Masonry, develops strength and adhesion quickly so it can be exposed to water in as little as three hours. Some caulk requires up to 24 hours or longer before it can be exposed to water. For homeowners trying to squeeze home maintenance projects into the weekend or pros who are looking to move to the next job, GE Silicone II* can decrease the waiting time, helping increase convenience, speed and efficiency. SUN-/FREEZE-PROOF - The outside of a home is exposed to harsh outdoor elements throughout the year. Extreme heat, the sun's UV rays and freezing temperatures can cause acrylic caulk to lose its flexibility and degrade. The permanent flexibility of GE Silicone II* keeps it from breaking down so it can protect a home over time. Degraded acrylic caulk can crack and crumble over time, leaving gaps for air and water to seep through. Those leaks can lead to water damage, mold growth and higher energy bills. Why 100 percent silicone? Unlike acrylic, silicone is permanently: Waterproof Acrylic breaks down in water over time. Flexible Acrylic becomes less flexible and can even freeze at low temperatures, making it more likely to crack. Shrink-proof Acrylic shrinks as the caulk dries. This shrinking can cause cracks over time. Crack-proof Acrylic hardens, cracks and crumbles over time when exposed to extreme heat and the sun's UV rays. Made in USA. Reduces plastic shrinkage and improves freeze/thaw durability. Over twice the tensil strength of nylon-high dispersion. Optimum quality for concrete to prevent up to 80 percent of concrete cracks. 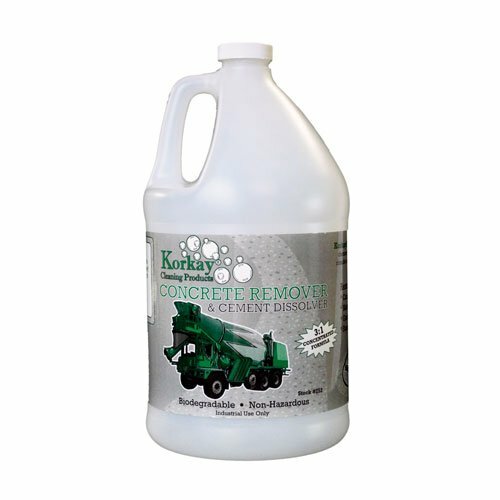 23 OZ, Sakrete Concrete/Mortar Dissolver, Is A Safe Environmentally Friendly Liquid Alternative To Aggressive Acid Concrete Removers, Can Be Used To Remove Dried On Cement, Concrete, Mortar, Or Stucco From Most Surfaces, Will Not Harm Or Fade Most Surfaces, Use As A Spray Or Soak Tools, Works In 15 Minutes, 100% Biodegradable, Non-Hazardous Formula, Contains No Acids, Will Not Harm Wood, Plastic, Metal Or Paint, Clean Up Cured Concrete & Masonry Residue On Siding, Foundations, Patios, Wooden Decks, Etc, Deactivates & Cleans Up With Water, Spray Bottle, UPC: 0 50605 18222 9. Ideal for use in occupied areas like post offices, schools, hospitals and other public places where safety is important. 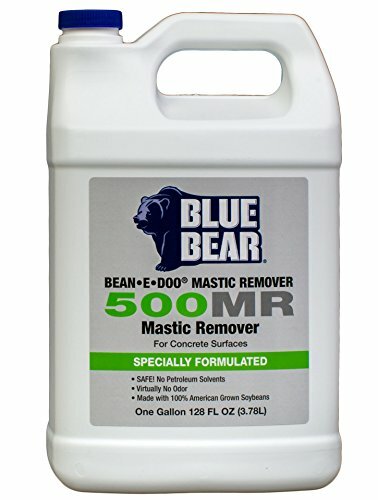 500MR removes newer mastics, layered adhesives and even glues 50+ years old, using the power of soybeans. It's the first product to pass both performance and environmental safety test by the USPS for the removal of mastic containing asbestos! Contractors find that 500MR works more efficiently, saves time, and helps create a safer restoration site compared to traditional hazardous chemical mastic removers. Give Your Concrete Super Powers! 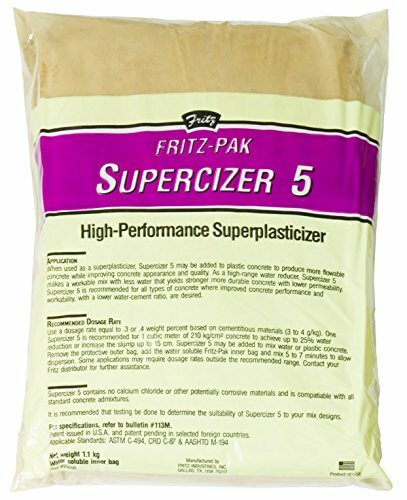 Fritz-Pak Supercizer 5 is a dry powdered admix, packaged in a ready-to-use water-soluble bag. 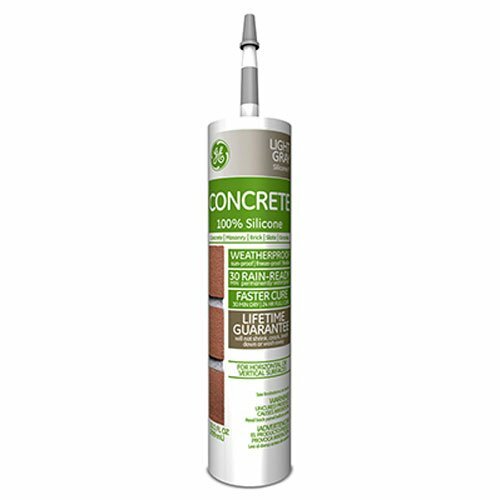 Supercizer 5 is formulated to produce stronger, more durable concrete. As a superplasticizer, Supercizer 5 may be added with the normal amount of mix water to produce more flowable concrete with up to a 6-inch (15 centimeter) slump increase. When used as a high-range water reducer, Supercizer 5 will reduce water requirements up to 25%, increase concrete compressive strength at all ages, reduce permeability and increase durability. Supercizer 5 does not contain calcium chloride, nitrates, nitrites or other potentially corrosive materials and is compatible with all standard concrete admixtures. Supercizer 5 is compatible with all air entraining admixtures, calcium chloride and other admixtures. When used with other admixtures, each one must be dispensed separately into the mix. What kinds of projects is Superplasticizer used for? Any project using cement or concrete can benefit from Fritz Pak Supercizer. Our product is a powerful tool that can help with anything from the shape and setting of stamps for concrete or pouring patios, sidewalks, pathways, walkways and driveways, to decorative pieces of artwork or fountains and statues for your yard. Sounds great, how do I use it? Our concrete agent is super easy to use, and dosage instructions are included with every package. Simply toss our water soluble bag into your mixer with your preferred plastic concrete mixture and the bag will quickly and easily dissolve while you mix at high speed for 5-7 minutes. Slump increase will last for 30-40 minutes while you pour and spread accordingly. Once set, your concrete will be stronger, less porous and resistant to harsh weather conditions. UNIQUE BLEND INCREASES STRENGTH AND DURABILITY. Simplify any project by enhancing concrete elasticity and flexibility with high early and ultimate strength, higher durability, lower permeability, and reduced shrinkage, cracks and creep. BETTER RESULTS FOR LESS MONEY. Supercizer 5 is an easy and inexpensive way to cut costs on home improvements, art projects, and masonry applications. Use less concrete while increasing slump and malleability without reducing strength after drying. FORTIFY YOUR CONCRETE AND KEEP YOUR COLOR. Our heavy duty, corrosive free admixture will not change the natural color of your concrete or mortar, and reacts well with pigments, dyes, stains and mixes. WHOLESALE PRICING FOR EVERYONE. Whether you're a do it yourselfer looking for supplies for stamped concrete designs or home repair, or a contractor on a job site, we offer bulk pricing for low quantities. 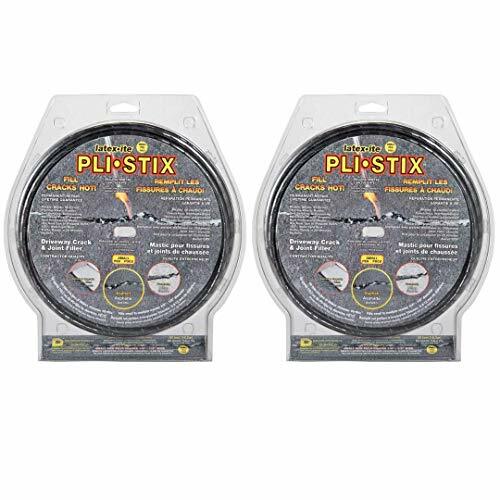 This product is designed for use with a heat gun or propane torch. It is convenient to use and works effectively. It is durable and long lasting as well. It is definitely a great quality product. PS101 is a chemically reactive deep penetrating siliconate sealer that fuses within porous substrates of concrete, brick, stone, exposed aggregate, and mortar to combat freeze/thaw damage, reduce scaling and spalling, impart water repellence, restrict moisture absorption, and limit harmful effects of deicing chemicals and salts, acid rain deterioration, alkali attack, corrosion of reinforcing steel, and UV damage. PS101 decreases efflorescence, limits dirt buildup and staining, retards mold and mildew, and makes easier to clean and maintain. PS101 is breathable with minimal impact to traction coefficient. PS101 creates a cross-linked insoluble methyl-silicone internal membrane that will wear away only if the substrate itself wears away below sealer penetration. PS101 enhances curing of new machine troweled concrete by allowing the slow release of moisture during the curing process while maintaining excellent breathability. PS101 is an excellent primer or moisture mitigation sealer for slab on grade floors by lowering hydrostatic moisture to promote adhesion of floor coatings, glues, and mastics. It is also UV resistant and nonyellowing. PS101 has a clear appearance. Upon proper application, the substrate will have little, or no, noticeable change in appearance when dry. It is recommended for curing new machine troweled concrete and for sealing existing concrete as well as masonry surfaces such as mortar, brick, block, stucco, natural stone, artificial stone, and exposed aggregate. 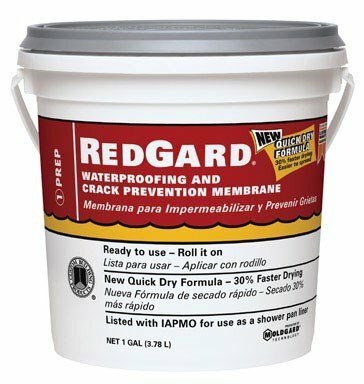 It is ideal for sealing commercial and residential structures such as parking decks and structures, workshop floors, warehouse floors, automotive garage floors, retail store floors, restaurant floors, basements, garage floors, home and building exteriors, brick walls, chimneys, driveways, sidewalks, walkways, porches, steps, pool decking, patios, and brick or stone pavers. Appropriate for use on architectural features such as mantels, furniture, ponds, fountains, and statues. Zero VOC, Water Based Sealer & Curing Agent for All Smooth Porous Concrete & Masonry. Combats Freeze/ Thaw, Repels Water & Moisture. Limits Stains & Molds, Makes Easier to Clean. Resists Salts & Deicing Chemicals, Decreases Efflorescence. Reduces Scaling & Spalling, Maintains Traction. 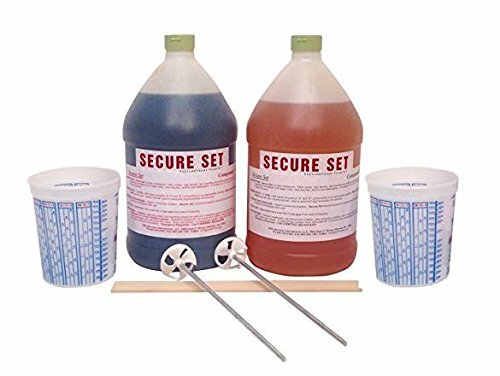 Secure Set - 20 Post Kit - Commercial Grade -4 Gallons. Fast, Secure & Safe Concrete Alternative for Easy Fence Post Installation. For more than 17 years, secure set has been a reliable and trusted partner to the electric utility, communication and transportation industries. secure set is now available for home diy and commercial use. it comes in 5 sizes, single post, 5 post, 10 post, 15 post and 20 post kits (standard 4x4 posts). secure set is an alternative to traditional concrete, works extremely fast, sets in minutes, not days. as a polyurethane closed cell foam, secure set is waterproof, protecting your posts below ground line, and can be installed in temperatures ranging from 0 to 100 f.
Commercial grade ! double the strength of any other product on the market! Our proprietary formula works with wood, metal, vinyl, pvc, concrete and fiberglass posts. Set it and forget it, secure set is designed to be and extremely fast!!! No water, no mess, no heavy bags, mix, pour and done. Secure set is 10x's faster than traditional use of concrete for fence post installations. 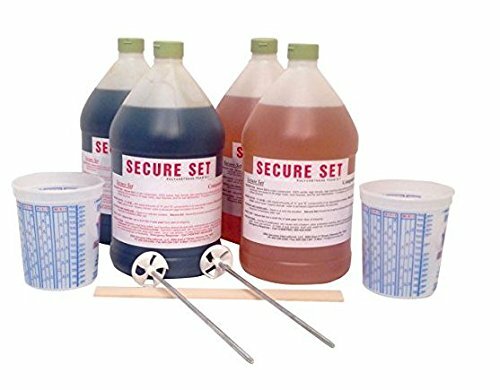 Secure Set - 10 Post Kit - Commercial Grade -2 Gallons. Fast, Secure & Safe Concrete Alternative for Easy Fence Post Installation. Quorate cement color, quorate, 10 oz. Capacity, bottle packing, liquid, Terra Cotta, flammability rating: 0, 1.7 - 1.9 specific gravity, application method: brush, roller, sprayer, water base, includes: twist-off cap, ASTM C979, use to add color to a variety of projects, including curbs, driveways, fishponds, floors, patios, sidewalks. 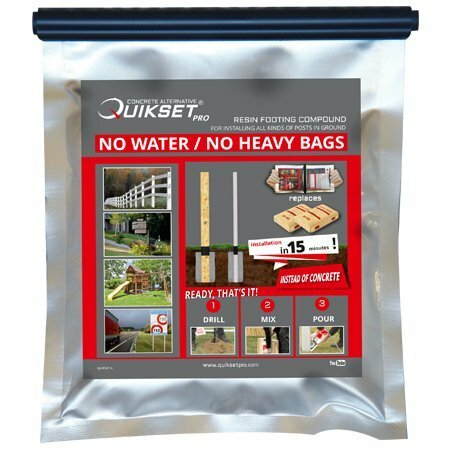 QUIKSET is a fast, light and durable innovative resin footing compound for installing wooden and metal posts and sections of various cross sections and shapes in the ground. It is a revolutionary alternative to heavy, dirty and time-consuming curing, ready to use concrete mixtures in bags. Q700 component bags replace up to 2 bags of ready mix 55 lb concrete mixture (See our Q300 and Q1000 for other quantities). QUIKSET is used for footing wooden or steel fences, road and information signs, garden lights, park benches, roofing, swings, picnic tables, playgrounds, flag poles, garbage bins, billboards and all types of park equipment or decorations. It can be used anywhere whenever an element must be installed into the ground. It is a revolutionary alternative to concrete which until now has always been used for the jobs. QUIKSET's compressive strength exceeds those of most soil ground types. This means that the ground is the weakest point in the connection and therefore will in most cases be responsible for the failure of an installation. QUIKSET is resistant to temperature changes. It works perfectly in very low temperatures. As opposed to traditional concrete QUIKSET is completely resistant to water, so it doesn't erode over time. The Q700 is ONLY 1.5 LBS but equates to (2) 55 LB BAG OF CONCRETE! Easy to use. Mix, Pour and Done - No Fuss - No Mess! Great for playgrounds, fences, signs, mailbox posts & more! 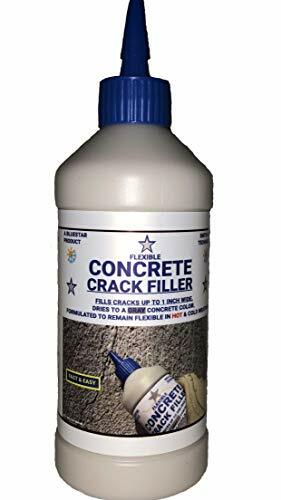 Use whenever you need concrete! DIY Market Friendly as well as Professional Industry Recommended! 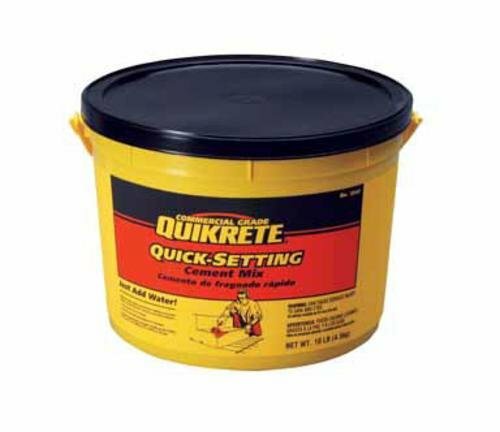 QUIKSET is a fast, light and durable innovative resin footing compound for installing wooden and metal posts and sections of various cross sections and shapes in the ground. It is a revolutionary alternative to heavy, dirty and time-consuming curing, ready to use concrete mixtures in bags. Q300 component bags replace 1 bags of ready mix 55 lb concrete mixture (See our Q700 and Q1000 for larger quantities). QUIKSET is used for footing wooden or steel fences, road and information signs, garden lights, park benches, roofing, swings, picnic tables, playgrounds, flag poles, garbage bins, billboards and all types of park equipment or decorations. It can be used anywhere whenever an element must be installed into the ground. It is a revolutionary alternative to concrete which until now has always been used for the jobs. QUIKSET's compressive strength exceeds those of most soil ground types. This means that the ground is the weakest point in the connection and therefore will in most cases be responsible for the failure of an installation. QUIKSET is resistant to temperature changes. It works perfectly in very low temperatures. As opposed to traditional concrete QUIKSET is completely resistant to water, so it doesn't erode over time. The Q300 is ONLY 0.7 LBS but equates to (1) 55 LB BAG OF CONCRETE! This concrete sealer penetrates within the concrete to protect not only the surface of the concrete but also below the surface of the concrete for best protection long term. IMPRESS YOUR NEIGHBORS FOR YEARS: ToughCrete concrete sealer is the #1 siloxane paver sealer for protecting your driveway, sidewalk, garage floor, Patio, or any other concrete surface. 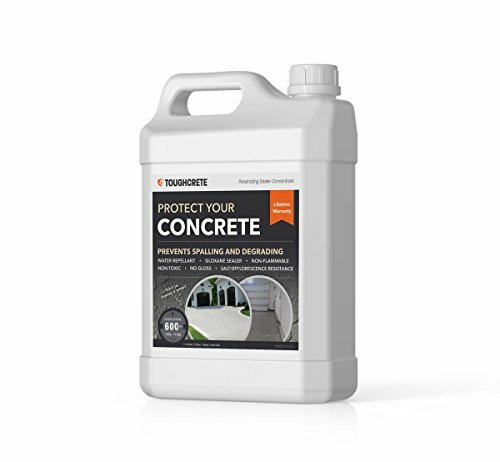 Unlike cheap Acrylic concrete sealers, which only last about one year and usually don't provide a full seal, ToughCrete penetrates deep into your concrete surface for 10+ years of protection from things like deterioration, water, and salt damage making it the best penetrating sealer. IMPROVED HOME VALUE : By protecting the life of your concrete driveway, sidewalks, patio, garage floor, and more allowing them to last longer, will help to improve the value of your home! Also works great as paver, block, cinder block, CMU, brick, chimney, and outdoor fireplace sealers. QUEST FOR BETTER HOME CARE: As a company, we build our products around a foundation of better home care for the average consumer. ToughCrete is a SAFE & Eco-friendly siloxane concrete penetrating sealer approved by the department of transportation. Made with the highest quality formula for complete protection. 10 YEARS TOUGH PROMISE: We know it works and we're giving you 10 years to try it out. If you don't like it, just let us know and we will provide a full refund. TWO SHADES of GRAY - GRAY & LIGHT GRAY. The unique blend fills and seals cracks in concrete. This product is flexible therefore it flexes with the contraction and expansion of concrete. It also remains flexible in hot and cold temperatures. It is DIY fast and easy to apply. No special tools required. Seals to prevent further damage. Two colors to choose from (Gray & Light Gray). Also use to fill cracks on concrete steps, garage, and basement floors. Made in USA. 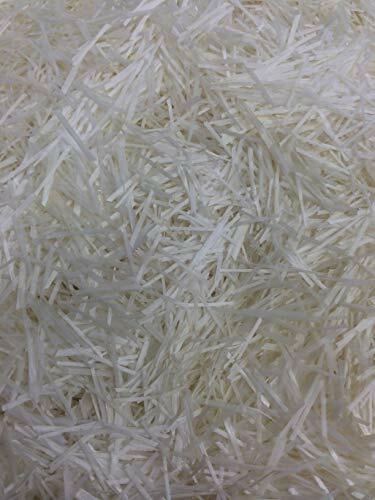 Used for concrete or other porous surfaces and can be used in interior or exterior applications. Weather and UV light resistant. Requires a top coat, compatible with solvent and water based sealers. 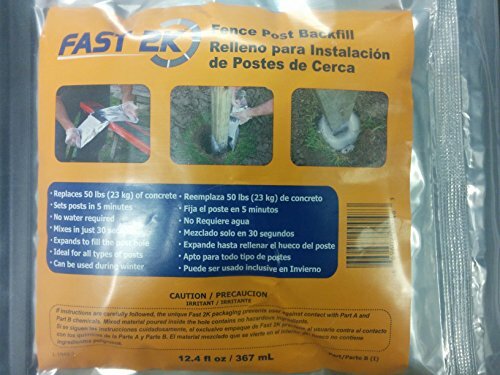 Fast 2K, 12.4 Fluid oz, fence post back fill bag, expands to set posts in minutes, no wide holes required as with concrete, same technology used to set utility poles, no water or hardware required, waterproof, helps to protect the post, can be used during winter, ideal for fence & Gate posts, mailboxes, signs, clotheslines, garden light posts, Gooseneck stands, bollards, Flag poles, sports posts & poles, & much more. Cement Dissolver uses a unique, biodegradable, non-acid chemistry which completely removes concrete by dissolving the calcium from the cement which allows the rinseable mud to be safely and totally removed from virtually any hard surface. Just spray on, wait 15 minutes and then rinse off." This biodegradable solution comes in a 3:1 concentrate for economical application. Most effective on concrete, mortar, grout and stucco less than 7 months old. Perfect prep product to open the pores of concrete floors for polishing or application of stain or epoxy. To use, mix one gallon of product with 3 gallons of warm water. Works best when mixed with warm water or left in the sun to process. 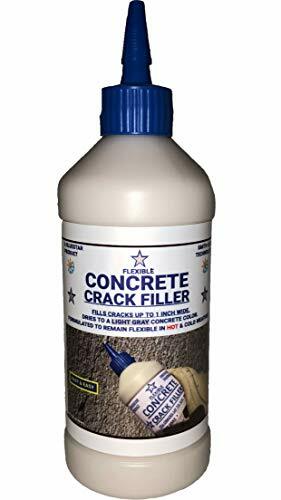 QT Sakrete Concrete Crack Filler, Seals Cracks Up To 1/2" Wide & 1" Deep, Remains Flexible & Cures To The Color & Texture Of Concrete, Protects From Water Penetration, Cures Completely In 12-24 Hours Of Normal Temperature & Humidity. TWO SHADES of GRAY - GRAY & LIGHT GRAY. The unique blend fills and seals cracks in concrete. This product is flexible therefore it flexes with the contraction and expansion of concrete. It also remains flexible in hot and cold temperatures. It is DIY fast and easy to apply. No special tools required. Seals to prevent further damage. 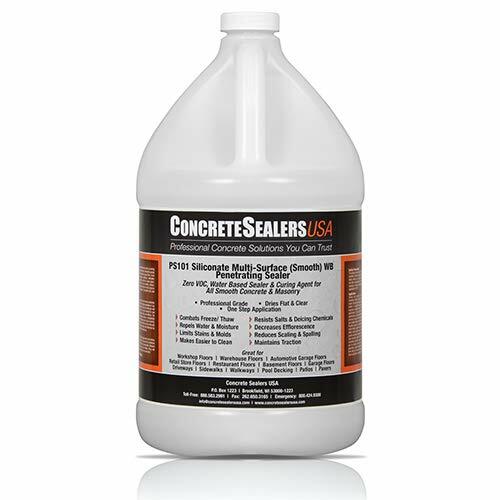 Also use to fill cracks on concrete steps, garage, and basement floors. Made in USA. 5 LBS - Anti-Crak HD fibers are typically used at low addition level to prevent cracking & improve the performance of concrete, flooring, renders or other special mortar mixes. They incorporate easily into mixes creating a tridimensional homogeneous network of reinforcement in the matrix. Anti-Crak HD fibers can be added at the central mixing plant to the wet concrete mix; or directly into the ready-mix truck. Anti-Crak HD fibers do not protrude through the surface and require no additional finishing procedures. The reinforcement is incorporated in the concrete mass and is invisible on the finished surface. 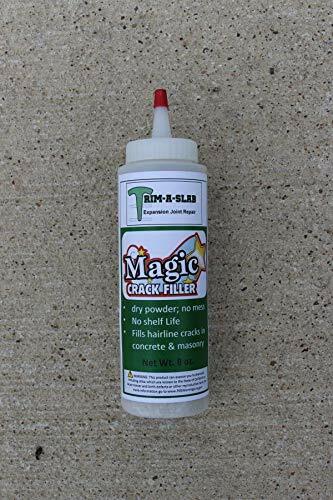 Trim-A-Slab Magic Crack Filler is a fine powder that fills hairline cracks in concrete, a complement to Trim-A-Slab to repair your driveway and sidewalk. To activate, simply mist with water. Trim-A-Slab Magic Crack Filler has no shelf life, unlike the caulk-like products that are generally suggested for crack repair. To use Magic Crack Filler, simply brush into the crack until it is full, then mist with water. That's it! 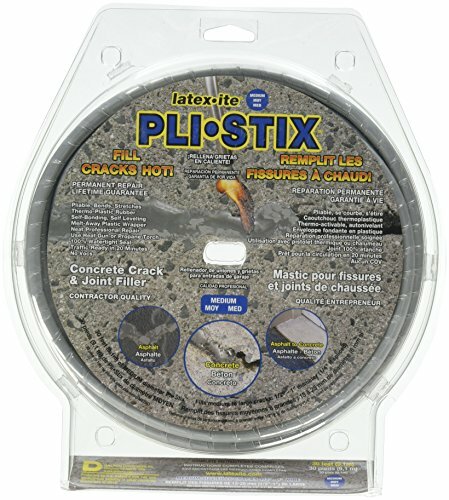 Latex-ite Pli-Stix 60 ft. Driveway Crack and Joint Filler - Small Black is a contractor-grade thermo-plastic rubber designed for use with a propane torch or heat gun. It is a permanent, patented, self-leveling seal for small asphalt and concrete cracks. 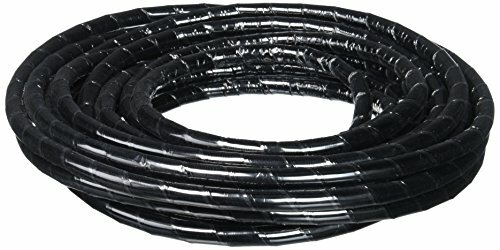 This product produces a 100% watertight seal. For depths of in. down to in. 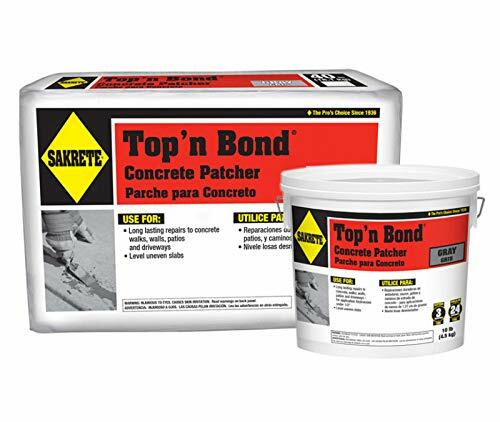 Sakrete Top 'n Bond Concrete Patcher - 10 lb. 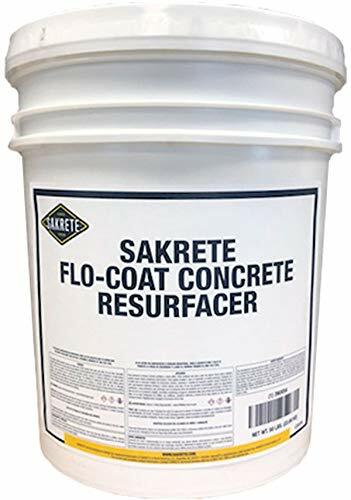 SAKRETE Top 'n Bond Concrete Patcher is a polymer modified sand cement repair mortar requiring only the addition of clean water. For resurfacing, patching and general repairs to concrete walks, walls, driveways, patios, and masonry. Can be used for applications from in. (13 mm) down to a featheredge or as a brush coat. 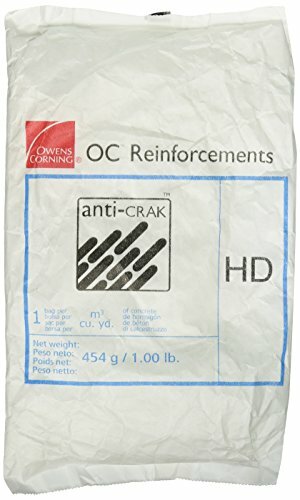 10 LBS - Anti-Crak HD fibers are typically used at low addition level to prevent cracking & improve the performance of concrete, flooring, renders or other special mortar mixes. They incorporate easily into mixes creating a tridimensional homogeneous network of reinforcement in the matrix. Anti-Crak HD fibers can be added at the central mixing plant to the wet concrete mix; or directly into the ready-mix truck. Anti-Crak HD fibers do not protrude through the surface and require no additional finishing procedures. The reinforcement is incorporated in the concrete mass and is invisible on the finished surface. Anti-Crak HD fibers are typically used at low addition level to prevent cracking & improve the performance of concrete, flooring, renders or other special mortar mixes. They incorporate easily into mixes creating a tridimensional homogeneous network of reinforcement in the matrix. Anti-Crak HD fibers can be added at the central mixing plant to the wet concrete mix; or directly into the ready-mix truck. Anti-Crak HD fibers do not protrude through the surface and require no additional finishing procedures. The reinforcement is incorporated in the concrete mass and is invisible on the finished surface.